#1 Selling Multi Card Lines Displays-Planos 4Less! HAPPY BIRTHDAY GREETING CARDS. GENERAL GREETING INSIDE FOR ALL. COLORFUL CAKE WITH CANDLES YOU GET 12 CARDS & 12 ENVELOPES * INSIDE VERSE READS " MAY ALL YOUR DREAMS AND WISHES COME TRUE "
HAPPY BIRTHDAY GREETING CARDS GENERAL GREETING INSIDE FOR ALL BRIGHT COLOR PINWHEELS YOU GET 12 CARDS & 12 ENVELOPES * INSIDE VERSE READS* " HAVE A BIRTHDAY FILLED WITH FRIENDSHIP,FUN,AND HAPPINESS "
HAPPY BIRTHDAY GREETING CARDS GENERAL GREETING INSIDE FOR ALL PRETTY FLORAL DESIGN,BRIGHT COLORS YOU GET 12 CARDS & 12 ENVELOPES * INSIDE VERSE READS * " I HOPE YOUR BIRTHDAY IS AS WONDERFUL AS YOU "
HAPPY BIRTHDAY GREETING CARDS COLORFUL PARTY HATS GENERAL GREETING INSIDE FOR ALL YOU GET 12 CARDS & 12 ENVELOPES **VERSE INSIDE READS** "THIS CARD IS SENT TO WISH YOU A BIRTHDAY THATS FUN ALL DAY THROUGH..WITH GREAT TIMES IN THE YEAR AHEAD TOO"
HAPPY BIRTHDAY GREETING CARDS GENERAL GREETING INSIDE FOR ALL PRETTY FLOWER DESIGN YOU GET 12 CARDS & 12 ENVELOPES * INSIDE VERSE READS * " LIKE A FINE WINE YOU GET BETTER AND MORE VALUABLE WITH AGE "
SYMPATHY GREETING CARDS. 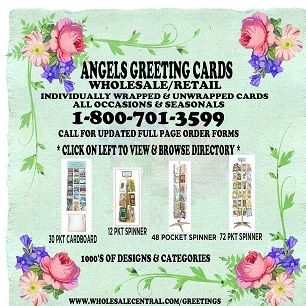 GENERAL FOR ALL YOU GET 12 CARDS & 12 ENVELOPES * CLICK ON PICTURE TO VIEW INSIDE VERSE "
CALL 4 FT. TO 32 FT.